At this year’s National Farm Machinery Show, John Deere will be exhibiting various pieces of agricultural equipment. John Deere will be attending this year’s National Farm Machinery Show, which offers the most complete selection of agricultural products, equipment, and services available today in the farming industry. The event is slated to take place at the Kentucky Exposition Center from February 13 through February 16 from 9 a.m. to 6 p.m. daily. The event is expected to consist of more than 860 exhibitors, making it the largest indoor farm show in the U.S. Almost every major line of farming equipment, including lines from John Deere, will be on display. This gives attendees an opportunity to see machinery up close and personal before investing in them for their own farms. At this year’s National Farm Machinery Show, John Deere will be exhibiting combines and tractors. The company will be located at Booth 6627 in the South Wing. In addition, the John Deere Store will be present at Booths 7054, 7056, 7058, and 7060 in the South Wing, selling Deere merchandise. Admission to the show is free. Parking for attendees costs $10 for cars and $20 for buses. Tickets are available separately for the Championship Tractor Pull, which is in conjunction with the National Farm Machinery Show. 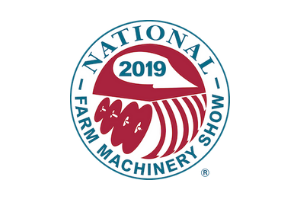 Louisville’s location in the Midwest and Southern corridor has made the National Farm Machinery Show accessible and attractive to farm equipment manufacturers and dealers for decades. Today, there are more than 900 booths on the show floor, exhibiting the latest in technology, equipment and gear for attendees from across the country.